During Build! 2017 Microsoft has announced the availability of Azure IoT Edge, which would bring in some of the cloud capabilities to edge devices/networks within your Enterprise. 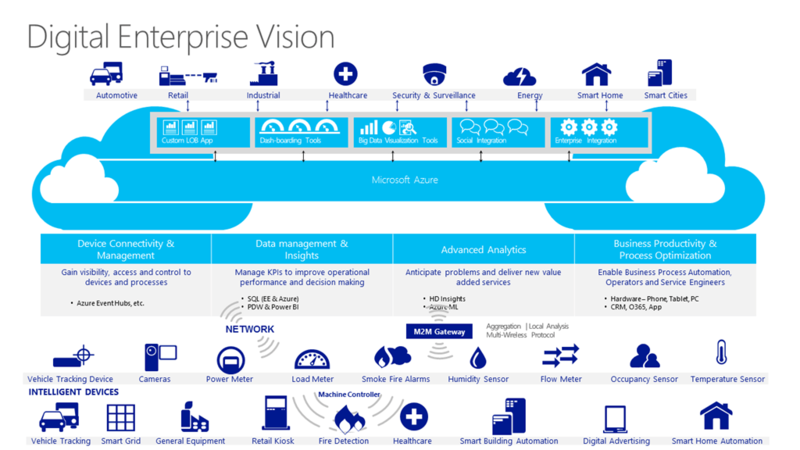 This would enable industrial devices to utilize the capabilities of IoT in Azure within their constrained resources . With this Microsoft now makes it easier for developers to move some of their computing needs to these devices. Edge devices are mostly having small foot print based to high end machines within your company network. Perform Edge Analytics (a cut down version of Azure Stream Analytics)- Instead of doing analytics in cloud developer/implementer can move the basic cloud data processing and analytical capabilities to Edge Device. Run your machine learning algorithms in Edge device and take predictive analytics steps. Perform Artificial Intelligence processing at edge device itself. Availability of Microsoft Cognitive Service on edge device would bring in whole lot of automation capabilities. Imagine Alexa/Siri working without internet connection, it should be able to provide you reminders etc. Perform RealTime Decision making locally based on predefined rules. Connect to other Edge devices and legacy devices within the constrained/corporate network. Deploy IoT solutions to Edge Device from Cloud and provide updates as needed. Operate offline without the need of real-time internet connectivity or intermittent connectivity. Doesn’t have to rely on Cloud to provide commands for processing, can do offline data capture and processing of information from other devices connected and take decisions without the need to rely on a connected cloud service. Microsoft .NET Core team has released an update to .NET Core 1.0, versioned as “.NET Core 1.0.1”. You can read the release notes for .NET Core, ASP.NET Core and Entity Framework 1.0.1 to learn about the specific changes that are included, including the commits that the release was built from. As part of Microsoft’s focused approach to bring in more value to Cross platform & Open Source based initiatives Microsoft has released Visual Studio Code IDE along with .NET Core runtime for Mac, Linux and Windows. Visual Studio Code provides developers with a new choice of developer tool that combines the simplicity and streamlined experience of a code editor with the best of what developers need for their core code-edit-debug cycle. Visual Studio Code is the first code editor, and first cross-platform development tool – supporting OSX, Linux, and Windows – in the Visual Studio family.